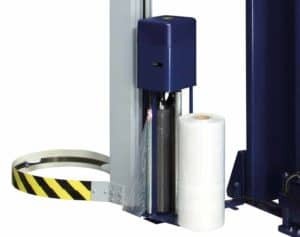 Robopac Rototech is the ideal solution for fully automatic wrapping with stretch film of products particularly unstable. The ability to keep the pallet still and stabilising products running a rotating arm is often a necessity for many industries. The Rotary family is of superior quality in a technological environment important for end packaging line. Al Thika packaging is providing Rototech machine which has excellent technical and construction and is the ideal choice to run the pallet wrapping reliably and effectively. Spool carriage with electromagnetic brake on return roller. Stretch tension adjustable from control panel. Brake coupling after cycle start for easy film hooking to pallet base. The electromagnetic dust brake ensure an high-precision control of the braking torque and don’t emit any polluting material. PDS Carriage with double pre-stretching system that can be activated from control panel. The carriage is fitted with a pre-stretching system fixed at 250%.By activating the “Stretch Control” control, the carriage can automatically switch to activate the stretch variable of electromagnetic clutch positioned on the first roll of stretch. The new feed system on an aluminum guide body welding or spreader of the film, made with a three-stage telescopic pneumatic cylinder, ensures a perfect adherence of the final round of film on the wrapped product. The new aluminum clamp controlled by a pneumatic cylinder holds the film clearly and without slippage during cutting. The cut of the film is obtained by hot wire and the welding with three straps adjustable in height and width. A robust structure made of steel plate 5 mm thick forms the backbone of this powerful rotating horizontal arm. Robopac has gone further and has produced the first adjustable rotating arm machine. 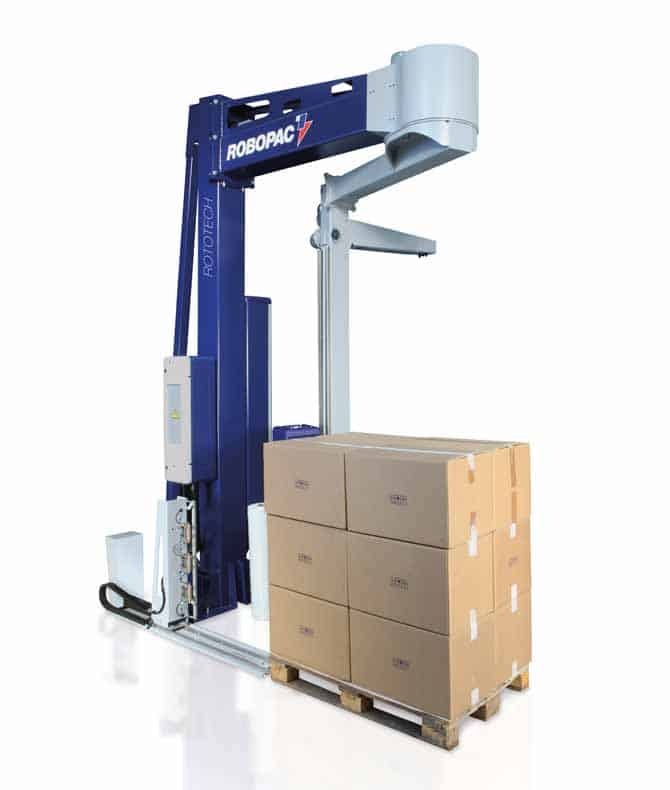 It is now possible to adjust the length of the rotating arm to its maximum horizontal movement, allowing the user to wrap products with maximum dimensions 1400 mm x 1400 mm. 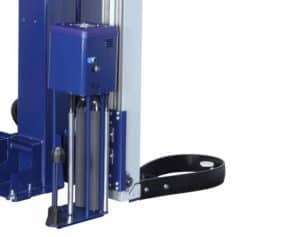 Wrapping dimensions of the Rotary can also be reduced by simply adjusting the minimum length of the horizontal rotating arm. 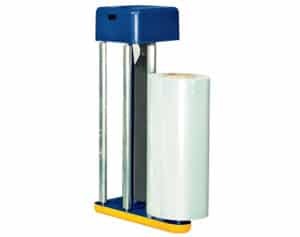 This allows wrapping products down to a size of 1200 mm x 1200 mm.